I am not what you would call a cryer. I do not tend to cry over real life events. I know people who cry once a week or once a day. This has never been me. Although tears were streaming down my face, had it not been such a public place, I would have been lying in the fetal position, wailing like a teething colicky infant. We saw it on Christmas Day and I still keep thinking about it. I had no interaction with Les Miserables before I saw this movie. Never read it, never saw it on stage, never saw any of the various adaptations. The title was a bit of a turn off. Someone posted the trailer to the movie, I watched and was hooked. I know there is a lot of divide on this matter, so if you hated it, we will have to agree to disagree. I thought the scenery was stunning, the acting was incredible, and the singing was marvelous. I have read a lot of criticism about the singing voices of the male voices, but I thought their voices added to the realism. I would not expect a 20 year prisoner (or a bounty hunting police officer) to have operatic training. I am a fan of Anne Hathaway, now only more so. I found the themes of the movie to really resonate with me. what a mother would do for her child is an ageless concept, but I LOVE the fact that this went further. A man, a total stranger, took Cosette in and demonstrate that a parent’s love is not dependent upon the gender of the parent. Jean Valjean loved Cosette as fiercely as Fantine did, that was evident. The love was different, but as deep. I don’t know if this is only a product of the movie, but I also loved the fact that there was never any tension between parent and child over the love interest. Cosette remained ignorant of Valjean’s knowledge of Marius, and as soon as Jean met Marius and saw his heart, Marius won his heart. Cosette NEVER lost faith and love in her papa, and that was beautiful. I am so tired of formulaic coming of age strife that drives a wedge between parent and child until we are given the climatic scene. Not here. 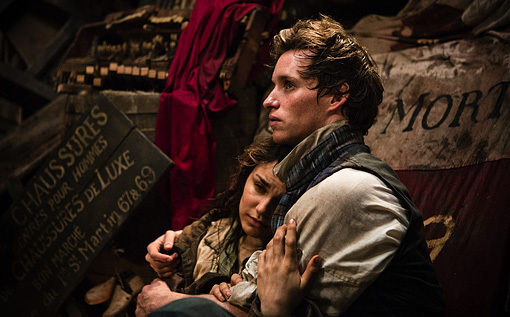 Speaking of lack of tension-I was also terribly moved by Eponine. I found myself continually waiting for the Mean Girl moment where she sabotages the love between Marius and Cosette. There are two reasons for this assumption. One: her parents weren’t terribly nice, upright people. I know that children can grow up to be quite different than their parents, but seeing her learn the trade at her father’s knee made me suspicious. Also, she was deeply in love and Hollywood has taught me that love, especially unrequited love, can make people a bit selfish and jerk-ish. Also, couples always have to overcome many adversities, which often includes betrayal by a friend. I suppose we could count withholding the letter, but honestly, he needed to get his head around the fight, and he couldn’t do that when his loyalties were divided. I cast her as noble and honorable throughout, which is shocking for a lovelorn character. Her story and especially her ending was beautifully told and beautifully acted. I think the omnipresent themes of strife are so well understood in our society. During the Arab spring, there was some real change, but there were also man aborted protests. Occupy Wall Street was a powerful movement that changed little. I think we can see a little of ourselves in the Student Uprising. So much passion, ultimately inert. The other major theme that stood out for me is the injustice of justice. Valjean committed a crime, but one that many a noble soul would commit-stealing to save another. He served his time and then some, 20 years of his life gone. He proves himself to be an upright person and serves his society well. Many people are better off thanks to him. It seems to me that he is more valuable outside the prison system than inside, and he is no threat. And yet Javert destroys two lives in his bitter pursuit of justice. It brings to mind all the people whose lives are destroyed due to nonviolent drug offenses. Instead of focusing on rehabilitation, we like incarceration. People have been upset at the use of tight screen shots during the singing, but I think that is the point. Even though these giant events are happening all around us, we all tend to focus mostly on our own lives and what is happening at the end of our noses. Go see the movie if you haven’t. And bring lots of tissues.